Johalla Projects is very pleased to present Hold Together, a new survey of works by Chicago-based artist Lisa Lindvay. For the first time, Lindvay will exhibit a comprehensive look at her seven-year long series of photographs that depict her family members grappling with the effects of her mother’s mental health. The exhibition will run from December 12, 2014 to January 18, 2015. There will be an opening reception on Friday, December 12th, from 6-9pm. In order to make new discoveries, Lisa Lindvay returns home. 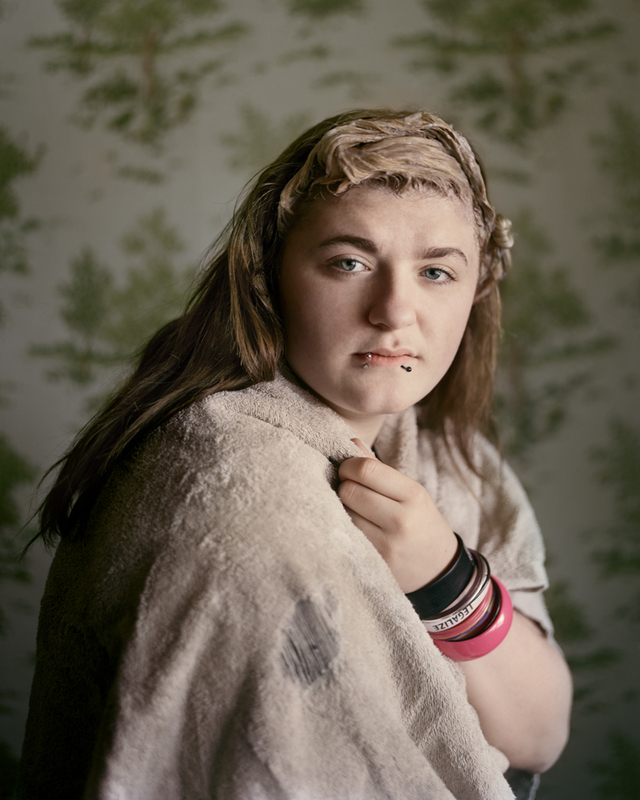 From the time she began graduate school in 2006, Lindvay has been photographing her immediate family in their Pennsylvania home. The works portray her brothers, sister, and father as they co-exist amidst the tangible absence of a maternal presence. Here, their house — however stricken by mess — serves as the unsuspecting background for the complex emotional currents that pulse between them. Suggestively pointing to religious iconography, art historical tropes, and advertorial gestures, Lindvay’s photographs are formal in their execution and contemplation. With this in mind, she brings more substantial arguments about popular culture, social norms, and notions about “true” or traditional domesticity to light. Interestingly, the final versions of each image are conceived in collaboration with the subject. This partnership, in turn, challenges and enriches conversations around the works’ relationships with broader themes of purposeful Abjection and the subverting of traditional portraiture roles in photography. In a wider context, the photographs in Hold Together exist as a powerful, achingly honest illustration of the inner workings of the American family navigating its way through instability, financial adversity, and the growing pains of adolescence. Often, her images recall photographs by canonical figures like Larry Sultan, Jim Golberg, or Tierney Gearon in their delivery and content. Much like these artists, Lindvay’s body of work feels vital and relevant in its time by urging us to pause and look. Lisa Lindvay (b. 1983) lives and works in Chicago, IL. She received her MFA in Photography from Columbia College Chicago in 2009 and BFA in Photography from Edinboro University of Pennsylvania in 2005. Her work has been exhibited in numerous national and international exhibitions, with highlights including the Addison Gallery of American Art, Andover, MA (2013); the Turner Contemporary, Margate, UK (2012); the Hyde Park Art Center, Chicago, IL (2011, 2010); and the National Portrait Gallery at the Smithsonian (2009). She is the recipient of a number of awards that include the Artadia Award (2012); the Aperture Portfolio Prize (2011); and the 3Arts Artist Award (2011).